Anthony Ujah wanted by Werder Bremen? Would he go? Should we panic?! Last week, Anthony Ujah was prevented from travelling to South Africa as part of the Nigerian national team due to visa issues. 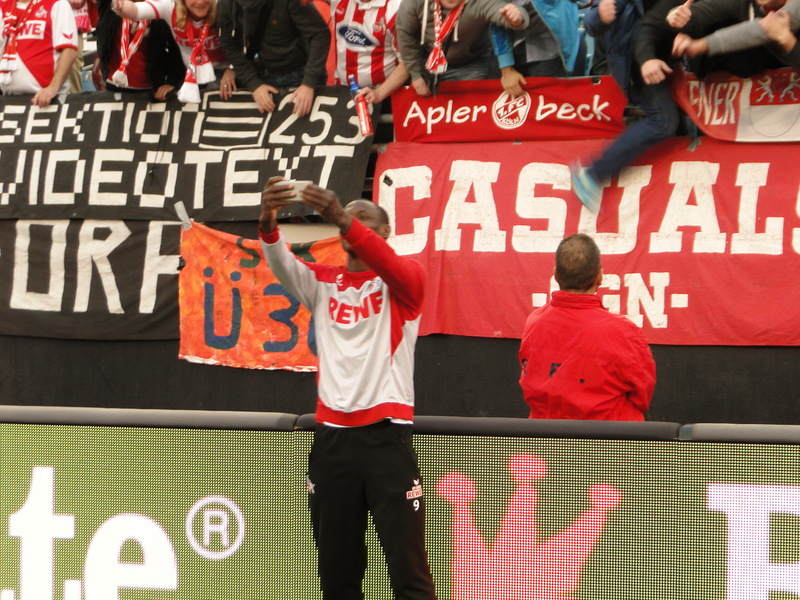 Office closures for a presidential election in Ujah’s home country caused the Kölsche Jung insurmountable complication and forced him to miss one of the two matches during the international break. Ujah was called back into national-team service after missing the cut for last summer’s World Cup and was in the starting eleven for Nigeria’s test with Uganda. Now, as Ujah returns to his adopted home in Cologne, another team wearing green-and-white is suddenly said to be interested in bringing Ujah into their club. Despite it being April Fool’s Day, Wednesday’s news of promising young forward Davie Selke agreeing to move to RB Leipzig this summer appears to be no joke. Further, discussions with Franco Di Santo have yet to result in a contract extension. The current deal with Werder’s leading scorer is set to expire next summer. In light of Ujah’s emergence as an offensive force at the Bundesliga level, with nine goals in 25 matches, it should be assumed that other clubs would take notice. When another club is faced with needing to replace some of its offensive talent, a rumor pairing the two can take flight very easily. Wherever the rumors began, the 1. FC Köln has yet to field any actual inquiries from Werder. The Kölner Stadt-Anzeiger reports that beyond saying the rumors were “sheer speculation,” the FC offered a flat “no comment,” which is also what Werder sporting director Thomas Eichin had to say on the matter. Which is fair and maybe also should serve as good advice to the rest of us. While Werder may be plotting, Ujah and the rest of the Effzeh are necessarily still in the midst of a battle for survival in the league. The international break so near the end of the season certainly gives too much time away from league play, opening things up to all sorts of discussion, but before we can worry too much about what might happen personnel-wise, we have plenty about which to worry with regards to what happens on the pitch for our own final eight matches, as well as those involving the clubs below. It all begins Saturday in Freiburg against a direct competitor in the relegation race against a side that’s already beaten our beloved club twice this season. Yet, how can we help but be concerned. We can’t all be Jörg Schmadtke and simply say, “I have no concerns that Tony will leave us in the summer,” and just get back to business. Schmadtke has a necessary professional distance from the emotion such a move would bring. But we do not . . . in fact, cannot! When I took the entire family to a US Open Cup playoff match a few weeks ago featuring two amateur sides, Henry continued to yell for “OOO-zhah!” at Seattle’s Memorial Stadium, little more than 24 hours after the 1:1 draw with Werder Bremen. Had Ujah been on the field, I think it would have made the game look a lot different. Even so, I do nothing to discourage my boys from shouting for Ujah, billy goats, or Germany whenever they feel so moved. We are devoted. I would unquestionable have concerns about not only how to explain to the boys that Ujah is no longer part of our soccer life, but also how our beloved club would replace the offensive loss. Fact is, the EffZeh has been largely challenged in the offensive-production department. Ujah’s nine goals have come somewhat despite the lack of flow on that side of the game. Werder is making a charge at a European spot, though it’s far from a given they’ll complete their run, having slowed from their quick start to 2015. Maybe they could offer him a raise, as well. Beyond that, what does Ujah have to gain from a move. He’s already a rock star in Köln and has used his status there to become a known quantity in the Bundesliga realm. If you’ve read my interview with him, you know he sincerely loves playing in Köln and for the FC. On the other hand, his star is on the rise, and Köln is a club still building toward becoming an established first-division presence. There are glories beyond what are on offer from love of club . . . as much as we fans and members may think that should outshine all. If a club values Ujah’s services at a figure that catches Schmadtke’s attention, Tönn’s legacy could end up being less about goals-scored and more about purchasing power for fleshing out the depth chart. But, again, I hope not. I’d rather he becomes a special player for the EffZeh and stamps his name in the annals next to some of the club giants who happen to also be some of the biggest name in German footballing history. It’s a bigger goal that requires a longer view, but it is in line with where the club wants and needs to eventually go. Be the first to comment on "Anthony Ujah wanted by Werder Bremen? Would he go? Should we panic?!"